We arrived in Bangkok on time & checked in at the 3* Asia hotel. This enduringly popular hotel is a good standard hotel in a very central location with an lively and excellent buffet restaurant - the best tuna & salmon I had for a long time. Boonlert had arranged two 5* hotels for us to inspect, one is the very good Montien Riverside hotel & the other is the beautiful Marriott Resort & Spa by the river. The new Montien Riverside hotel has panoramic river views from guest rooms, restaurants, Café and lobby. The Riverside Garden Terrace has a pier for the hotel dinner cruises on the Chao Phraya River. It has all the luxury of a 5* hotel. The Marriott Resort & Spa is a very special deluxe hotel. It has the tropical feel more like a luxury beach resort than a city hotel. The large swimming pool is surrounded by exotic tropical gardens. The coffee lounge entrance is a large wooden deck platform over an indoor pond & the sound of the running water. The resort’s Mandara spa is outstandingly beautiful. The entrance from a jungle of trees with the beautiful smell of exotic fruit & perfume is very enchanting. The spa & treatment rooms are very beautiful and one can relax by looking at the soft lighting colours, flowers in the large water pots and the wooden Asian furnishing. Next morning we got up early to join the 3 day/2 nights Western Off Road & Adventure tour of River Kwai. 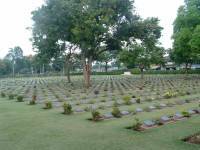 It was a three hour drive from Bangkok to get to the War Museum & Cemetery at Kanchanaburi by nine. The war museum was very interesting with details of the whole history of the 'Death' railway. There are nine galleries from introduction to construction to life in camp to operation to after the war. The war cemetery is across the road from the museum. 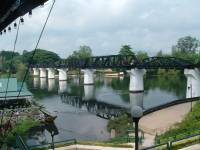 After the cemetery we went on to the famous Bridge over the River Kwai. This part of the bridge has become very commercial, with souvenir shops, restaurants, market stalls etc for the tourists. Despite all these the scenery of the bridge & the river is still beautiful. 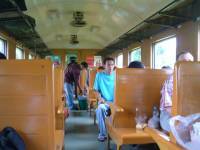 We headed for the rail station to take a ride on the Death Railway. The train has 1st & standard class tickets: we decided to stay in standard. As the train approached everybody piled in both sides of the carriage. One has to be quick to get a seat before fill up very quickly. The seats are wooden benches for two people on each side but a local family of four or five will all sit upon each other on one bench. There is also room for people standing along the corridor. If you want the best view of the river later on in the journey sit on the right hand side facing ahead. The train will stop at many places during the journey of about one hour. There are sellers of drinks, fruits & food on & off the train. The lovely countryside, lush jungle & the River Kwai comes into view half way through the trip. At the end of the line we got off and were picked up to go to lunch at the local restaurant by the river pier, after which we took a long-tail boat ride to our first night's accommodation, the Jungle Rafts. 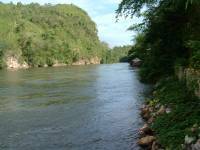 The 45 minutes ride on the River Kwai to the Jungle Rafts is as pleasant as the ride on Mekong River in Luang Prabang to the caves. The difference is the River Kwai is dark green while Mekong River is muddy colour. 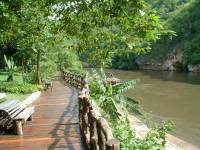 The River Kwai is lush with green jungle and mountains on either side. The view of Jungle Rafts on arrival is quite breathtaking. 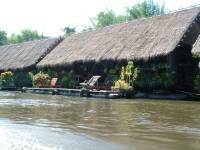 The beautiful view of a row of lovely thatched roof huts like bungalows floating on platforms on the fast-flowing river is unique & tranquil. It blends in very well with the environment. Because of this jungle setting the accommodation has no electricity or hot water, just hurricane lamps at night. The whole accommodation including the restaurant is on floating rafts. In front of each room, a second lower floating platform provides a sun deck, beautifully decorated with flowerpots, hanging flower baskets & reclining wooden chairs. The other side of the river just hills and jungle. It was so peaceful & calm. The only sound was the water of the river, broken occasionally by the engine of the long-tailed boat passing by. I was mesmerized. Before darkness fell the clear sky began to be shadowed by the clouds & the rain came down. The scenery was now changed into a more dramatic one. I watched, under the thatch roof, the rain hitting the river bouncing off like a little individual water fountain. The rain did not spoil the beautiful environment but creating a different atmosphere. The rainstorm stopped after about an hour and the staff of the floating hotel began lighting the lamps for the walkway, leaving one lamp by the door of each room. The scenery changed again into a romantic & primitive setting. The river is now swallowed into the dark so is the hill on the other side of the river. The whole environment is in darkness. There is no fear but relax & calm in this magnificent jungle setting. Evening dinner for all hotel guests is taken together. The food was good & plentiful and the atmosphere was excellent. After dinner a culture show was performing at the hotel theatre. After the show darkness & quietness returned to the environment. Lying on the bed the sound of the river running underneath could be heard throughout the night. It was so peaceful but I was woken by the sound of the long-tailed boat engine at early morning. It was time to get up for trek today into the jungle by jeep along the rough & bumpy dirt road. We were teamed up with two friendly but wild looking guys for our adventure into the jungle. We drove through forests, muddy & rocky path, stream & pool of water for a couple of hours of fun & adventure. At times it’s a bit scary. We arrived at the Golden Land Jungle Camp in time for our lunch break before the trekking on foot. 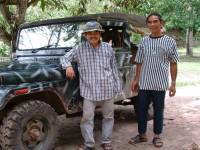 The owner of the Golden Land Jungle Camp is the driver who took us there. It is inside the national park. 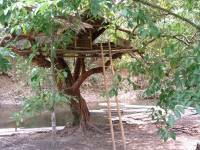 The camp has a simple restaurant and a number of basic accommodation bungalows. A young man in his early twenties with long shoulder length hair looking like Heathcliff lives at the camp. He prepared the meal for our lunch before we arrived. It was a lovely simple meal of rice, vegetables & cook meats followed by yellow & green mangos. The mangos were from the trees in the camp. They were fresh & delicious. After lunch we began our trekking into the jungle. The trek takes an hour or so, 'Heathcliff' leading the way fast ahead of us. The jungle is green, lush & peaceful, with the refreshing sound of the river. The echo of our footsteps stepping on branches & leaves was enchanting. If you like walking through nature this is for you. The way back to the camp is by water rafting on the river. 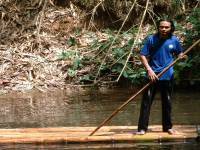 The raft is made of long bamboo poles tied together. It’s about 10 feet wide & 30 feet long. Heathcliff jumped onto the raft at the front with a bamboo pole to 'punt' the raft and we sat on a slightly raised bamboo platform in the middle of the raft. The river in May is shallow but in other seasons while it is deep life jackets are provided. It started slowly & smoothly but when the river drops the raft follows fast. The fit & athletic young man would kneel & bend to guide the raft with his pole along the river avoiding the rocks. Most of time the raft was under the water & our feet & bums are wet through. The skill of Heathcliff guided the raft through the most beautiful scenic landscape of the river. It is the same way out of the jungle with the 4x4 jeep in the late afternoon. We came across a two pickups, one stuck in the mud. Our driver volunteered to help to pull the pickup out of the mud with his jeep. It took three attempts before the pickup was pulled out safely. Unfortunately it broke our jeep’s drive shaft. Our drivers assistant/mechanic showed his skill by repairing the drive shaft within half an hour. It was good timing because the dark clouds was threatening in the sky. The rain was beginning to fall as we left with the rescued pickups following behind. The rain got heavier. Our driver drove on controlling the jeep skilfully. The rain & mud was splashing onto us. There is one difficult downhill rocky path that I was worried about earlier & it is now uphill on the return journey. With the rain & water washing downhill our driver gunned his engine & roared up the hill like a hungry wild animal. This was raw power. We had the adventure that we were looking for in this jungle trip. If you do not mind wet, dirt, dust, rough & bumpy road then this is for you. We checked in at the Resotel hotel for overnight. Owned and managed by the same company as the Jungle Rafts, the Resotel is more conventional hotel, the accommodation consisting of air-conditioned bungalows with the usual facilities, set on a hillside beside the river, together with a restaurant/bar & swimming pool. Next morning we headed for the Hell Fire Pass Memorial. 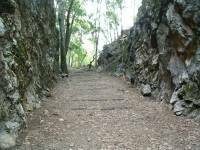 This is a very interesting walking trail of 4.5km through a section of the original railway, giving visitors the chance to walk in the footsteps of those men, many of whom sacrificed their lives during the construction of the infamous Thailand-Burma Railway. The most haunting part is the Konyu Cutting. We returned to Resotel resort to have lunch then drove back to Bangkok in the late afternoon. We met up with my Bangkok agent for the lovely dinner buffet at Asia hotel. We left for our return flight to UK in the evening. Arriving back to UK next morning. This 17 days tour of four countries can be tailor made for you with additional city tour in Bangkok on Day 1 arrival & also city tour in Ho Chi Minh before flying to Phu Quoc Island.